Formatting documents in APA style is required by many journals and institutes, especially in North America. The APA style was originally developed by the American Psychological Association and contains extensive guidelines for writing, using sources, referencing, adding footnotes, and formatting. The complete guidelines for the APA style are very extensive and can be found here. 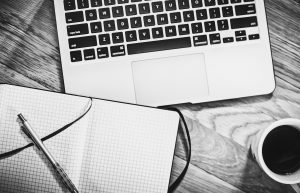 If it is your first time preparing a document in APA style it can be time-consuming and frustrating to figure out how to format your document correctly. And you probably did not look for tips on formatting your document in APA style until after you wrote most of the text. This is unfortunate because formatting from the start will save you a lot of time later on. 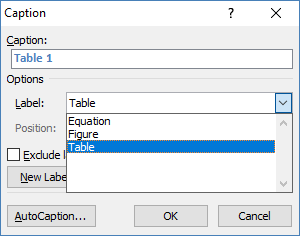 Here are some tips on how to format the table of tables, table of figures, and your references. Generating the Table of Tables may seem a difficult task but it is actually fairly easy once you know how to do it. Make sure that for each table you write a title above it, the title (in italics) should be a brief explanation of the content of the table. Now, with your cursor in front of the title of your table go to the References tab and click on Insert Caption. A drop-down menu will appear where you choose Table (see Figure 1). The table number and title will appear in bold and blue (see below), you can change this later if you want with the regular font formatting tools. The program will automatically generate the correct table number, even if you insert a new table in a document somewhere between existing tables. Subsequent tables will be automatically renumbered. However, when changing the order of tables, tables will not automatically be renumbered. To fix this, right-click on the number of the table and select Update Field. An easy way to check whether table numbers are in the right order is to update your Table of Tables (see below). Now go to the page where you want the Table of Tables (a content list of all your tables) to appear and then in the References tab click on Insert Table of Figures and then on Ok. The Table of Tables will now appear with the correct page number behind it. You can update the Table of Tables by again in the References tab clicking on Insert Table of Figures, when the program asks you whether you want to replace the selected table, click Yes. Alternatively, right-click on the Table of Tables itself and select Update Field. Below each table spell out each abbreviation you used in the table and also add other information that is essential to understand the table. Double-space the data in the tables. Make sure you refer in the main text of your manuscript to each table at least once (Table x), and that after inserting additional tables, or moving a table around, the table number in the text is still correct! Formatting the Table of Figures is of course very similar to formatting the Table of Tables. Place the title of the figure (in italics) below the figure. In the caption that you write below the figure title, explain how the data were generated, what the axes indicate, spell out abbreviations, and add any other information that is essential to understand the figure. Double-space the caption. Again, make sure you refer in the main text of your manuscript to each figure at least once (Figure x), and that after inserting additional figures, or moving a figure around, the figure number in the text is still correct! From the day you start reading and collecting materials for your manuscript you should start using reference management software. You can find more information on the use and choice of reference management programs in one of my blogs here. Below some tips for using these programs, with Endnote and Mendeley as examples, other programs work similarly. After installing a reference software program (such as Endnote) make sure your Word program displays the tab of that program (via File > Customize ribbon > etc). Select APA in the Style box and click Insert Citation to look for the correct citation in Endnote. You do need to enter the references in the Endnote program before being able to select them here. Most features are pretty much self-explanatory, just get started. If you turn Instant Formatting to On a reference list will automatically appear at the end of your document. You can easily move this list to a different page (such as before the tables and figures section). You can tweak the format of the reference list in Endnote (via Edit> Output Styles) and save your new Output Style under a different name. For some reference software programs (such as Mendeley) you will find similar options under the tab References. In Mendeley, a convenient way to import references is to import the PDF into the program after which the program will extract the required information (always check though, as this is not a perfect process). You can tweak the format of the reference list in Mendeley (via Tools > Options). If you have any specific formatting questions email me at EVScienceConsultant@gmail.com or leave a comment below so I can add the answer.